Researchers at MIT are using "high-speed digital imaging equipment and a fancy fly swatter" to figure out how they're able to evade many of our best efforts to kill them, reports Reuters. 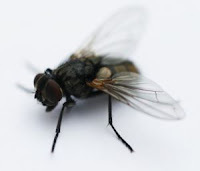 The main reason is how fast flies respond to a threat: within 200 milliseconds. In an NPR report on the MIT research, Pound360 learned that the flies actually jump in the opposite direction of a threat before buzzing its wings and flying away. So what advice do MIT researchers give for swatting flies? Simple. "It is best not to swat at the fly's starting position," MIT's Michael Dickinson told Reuters. Instead, "aim for the escape route." That or just open a window.